On a positive note - we actually have a picture of Walker with Santa - mind you, this is attempt #2 for the year...we went to Anderson mall a few weeks ago...total bust. As soon as Walker saw Santa - immediate tears! I mean CROCODILE tears! They snapped a few pics, but certainly not ones you'd want to buy. Brad videoed the whole thing and claims it was quite cute - I haven't even looked at it yet! We were supposed to go with Aunt Autumn and Alexa this past Fri night to see Santa at a friend's house, but after a long week, we just didn't have the umph to get there...so we tried again this morning. 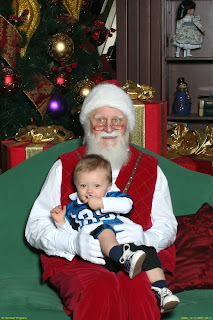 I used the "back him in" approach - several pics were snapped...and then Walker realized there was a white glove holding him, and attached to that white glove...oh no, a stranger....SANTA - and then his little face dissolved in tears and it was all over. He couldn't jump out of ol' St. Nick's lap fast enough! I had attempted to grab paci before he realized who had him, but that didn't make him very happy either...obviously Santa got distracted for a minute, but this was the best of what they shot. If you look closely, behind that hand & paci, you can see Walker's little grin...maybe next year will be better!